mediterranean cypress essential oil (organic) (2 drops) + Juniper essential oil (organic) (2 drops) + Celery seed essential oil (2 drops) + Helichrysum essential oil (organic) (2 drops) + Mastic essential oil (organic) (2 drops) + Calophyllum Oil (organic) (4 drops) + Rosehip Oil (organic) (4 drops) . Mix essential oils with vegetable oils and apply to areas 3x/day until improvement. mediterranean cypress essential oil (organic) (2 drops) + Macadamianut Oil (organic) (10 drops) + Eucalyptus radiata essential oil (organic) (2 drops) + Niaouli essential oil (organic) (2 drops) + Ravintsara essential oil (organic) (2 drops) . This mixture is suitable for bronchitis with a dry cough. Mix oils and massage the back and chest. Alternate massages: for 2 weeks perform a massage 4x/day. Then, for two weeks, perform 2 massages a day. Let one week go without massaging. Renew in the same order for the 4 following weeks. 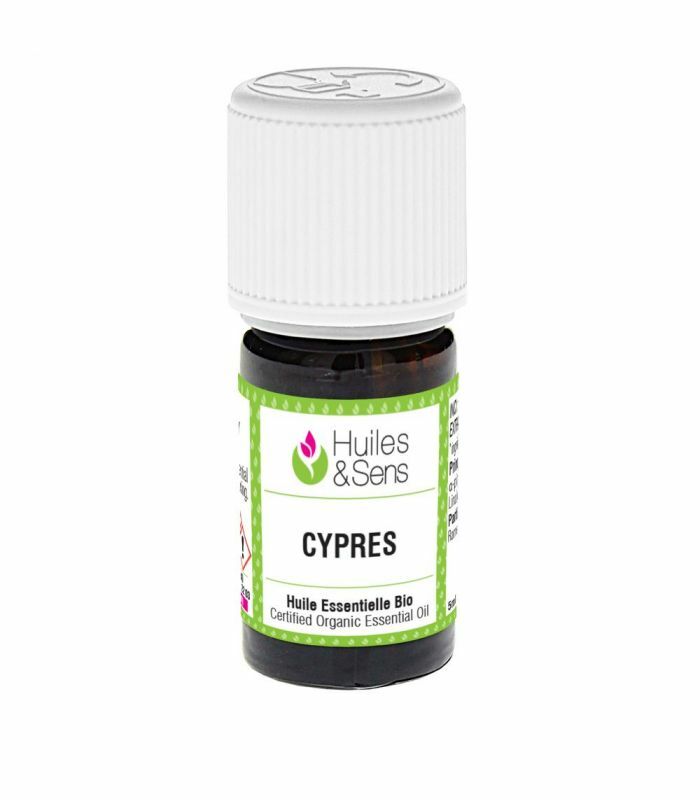 mediterranean cypress essential oil (organic) (12 drops) + thyme thujanol essential oil (20 drops) + Helichrysum essential oil (organic) (12 drops) + Mastic essential oil (organic) (12 drops) + Calophyllum Oil (organic) (2 ml) . Make this mixture into a 10 ml vial. Apply 3 drops of this mixture on the areas to heal 3 times a day until improvement. mediterranean cypress essential oil (organic) (1 ml) + Niaouli essential oil (organic) (1 ml) + Peppermint essential oil (organic) (0.5 ml) + Juniper essential oil (organic) (1 ml) + Mastic essential oil (organic) (0.5 ml) + Patchouli essential oil (organic) (1 ml) + Calophyllum Oil (organic) (50 ml) . This lotion to be prepared by yourself is to be applied to the legs, in an upward massage (from bottom to top). Perform 2 massages (once in the morning and once in the evening) for 5 minutes. mediterranean cypress essential oil (organic) (1 ml) + Rosehip Oil (organic) (3 ml) + Cistus essential oil (organic) (1 ml) + Geranium bourbon essential oil (organic) (2 ml) + Wheat germ oil (3 ml) . Mix oils and dab affected areas in the morning and at bedtime. mediterranean cypress essential oil (organic) (0.5 ml) + thyme thujanol essential oil (0.5 ml) + Tea-tree essential oil (organic) (0.5 ml) + Eucalyptus radiata essential oil (organic) (0.5 ml) . Prepare a mixture with these 4 essential oils. Apply 2-3 drops of this mixture previously diluted in some aloe vera gel or neutral cream base (Creme Elementaire) 2-4 times per day onto the chest. mediterranean cypress essential oil (organic) (10 ml) + Eucalyptus radiata essential oil (organic) (10 ml) . This preparation is easy to do! Pour a few drops in your diffuser (preferably cold diffusion) and run 5 minutes once every 2 hours. mediterranean cypress essential oil (organic) (1 ml) + Sweet almond oil (organic) (30 ml) . Prepare a lotion with these two ingredients. Apply in the evening before bedtime on your child's back and under the sole of the feet. Use only a few drops. mediterranean cypress essential oil (organic) (6 drops) + Niaouli essential oil (organic) (6 drops) + Peppermint essential oil (organic) (6 drops) + Juniper essential oil (organic) (6 drops) + Mastic essential oil (organic) (6 drops) + Jojoba Oil (organic) (20 drops) . Mix all components and put them in an opaque bottle. Massage from the foot to the thigh, 3x/day until improvement. mediterranean cypress essential oil (organic) (1 ml) + Evening Primrose Seed Oil (organic) (20 ml) + Cistus essential oil (organic) (1 ml) + Peppermint essential oil (organic) (1 ml) + Mastic essential oil (organic) (2 ml) + Aspic Lavender essential oil (organic) (2 ml) + Helichrysum essential oil (organic) (2 ml) . In an amber glass bottle 30ml, mix all oils and apply up to 5 x/day. mediterranean cypress essential oil (organic) (1 ml) + Aspic Lavender essential oil (organic) (1 ml) + Litsea cubeba essential oil (organic) (1 ml) + Sweet almond oil (organic) (10 ml) . In a 15 ml bottle, pour and mix all ingredients. Shake well. Massage the solar plexus with a few drops of the mixture up to 3 times per day. Continue for 10 days. mediterranean cypress essential oil (organic) (2 ml) + Helichrysum essential oil (organic) (2 ml) + Mastic essential oil (organic) (2 ml) + Sage essential oil (organic) (2 ml) + Calophyllum Oil (organic) (5 ml) . Mix ingredients and massage the lower back from the outside to the inside in a circular motion and then the solar plexus in the same manner. Renew 3x/day for 1 month. mediterranean cypress essential oil (organic) (2 drops) + Tarragon essential oil (2 drops) + Helichrysum essential oil (organic) (2 drops) + Mastic essential oil (organic) (2 drops) + Sweet almond oil (organic) (10 drops) . Pour ingredients in a small 5-ml vial. Take 4 to 5 drops and massage around the ear 3x/day. mediterranean cypress essential oil (organic) (0.5 ml) + Sage essential oil (organic) (0.5 ml) + Peppermint essential oil (organic) (0.5 ml) + Geranium bourbon essential oil (organic) (0.5 ml) + Field Mint essential oil organic (0.5 ml) + Aloe Vera Gelly (organic) (100 ml) . Mix these essential oils to 100 ml of aloe vera gel. Apply a dab of this mixture under the armpits after your shower in the morning. mediterranean cypress essential oil (organic) (4 drops) + Macadamianut Oil (organic) (5 ml) + Wheat germ oil (5 ml) + White clay (1 teaspoon) + Helichrysum essential oil (organic) (2 drops) + Lavender essential oil (organic) (4 drops) + Bay Laurel essential oil (organic) (4 drops) . Mix all ingredients so as to obtain a homogenous paste. Apply a thick layer of the paste to the affected area morning and evening. mediterranean cypress essential oil (organic) (1 ml) + Mastic essential oil (organic) (1 ml) + Patchouli essential oil (organic) (0.5 ml) + Helichrysum essential oil (organic) (1 ml) + Lemongrass flexuosus essential oil (organic) (1 ml) + Calophyllum Oil (organic) (20 ml) . Mix all ingredients in a bottle of 50 ml. Apply a few drops of this mixture and massage the lower abdomen, twice a day for 3 weeks. mediterranean cypress essential oil (organic) (1 ml) + thyme thujanol essential oil (1 ml) + Tarragon essential oil (1 ml) + Sweet almond oil (organic) (20 ml) . Mix these ingredients in a drop dispensing bottle of 30 ml amber glass. Apply 2 to 3 drops of the preparation to the solar plexus and the sole of the feet twice a day until improvement. mediterranean cypress essential oil (organic) (1 ml) + Pine needle essential oil (organic) (1 ml) + cedar essential oil (organic) (1 ml) + Calophyllum Oil (organic) (10 ml) . Prepare this mixture in a 15-ml vial. Apply to areas you wish to treat (following a massage techniques shown in massage section of the site), once in the morning, after showering, and once in the evening. mediterranean cypress essential oil (organic) (2 ml) + Macadamianut Oil (organic) (10 ml) + Helichrysum essential oil (organic) (1 ml) + Mastic essential oil (organic) (2 ml) . Apply a few drops on the legs and massage from the bottom upwards. Proceed in the same manner by massaging the arms.